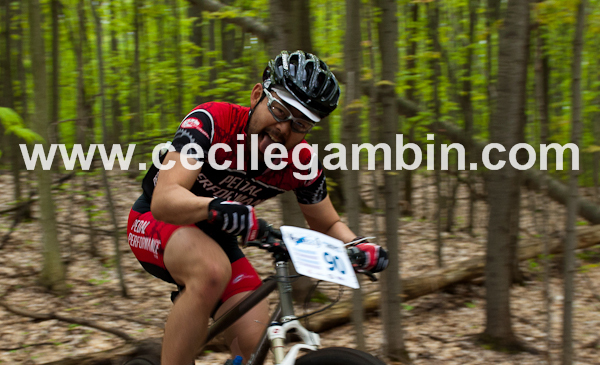 The final round of the Enduro series was held in the beautiful Halton region with cool temperatures, sunny skies and a hint of rain. Well…maybe not a hint but more like a short downpour. 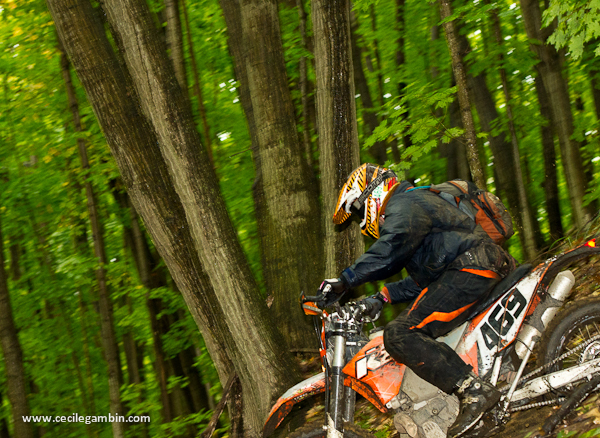 Kudos again to all the participants and to all the volunteers (HORRA) who have put on another successful enduro. I had my work cut out for me today and definetily made the right choice of using my car instead of my KTM to get around to the different areas. I needed my full gear (2 tripods, flashes, lenses etc.) as the light went from sunny to cloudy and back to sunny to full on rain. This poor fellow decided to take a drink but lukily saved his bike and he was able to lift it back upright and continue along merrily…although a wee bit wet and cold now. My left foot took a similiar drink as water came over the top of my boot while I was setting up my tripods in the river. 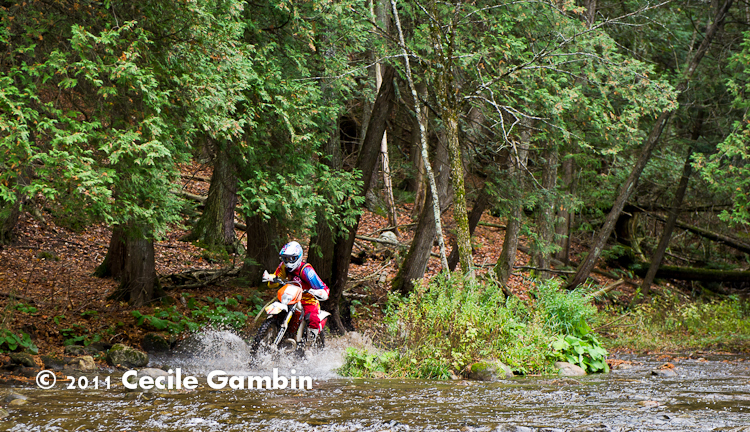 I had wanted to bring them a bit closer to the riders but the current was fairly strong in the middle (and deep). Plus I really didn’t want anybody knocking them over. 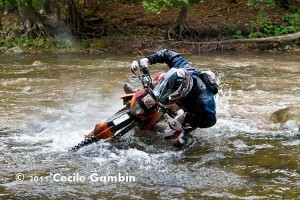 SB-800’s do not like water. No spark plugs to change here … just a lot of electronics. So I had to do with the ambient light and whatever light I could get from my flashes. This was definetly my hardest shoot to date. Trying to rig up the flashes to not bounce off the water, keeping them from a safe distance, putting plastic bags over them to keep them dry, and forever changing their output levels (light kept shifting constantly) made for a very busy and hectic afternoon. I learned a lot from this experience. Not only did I learn from a technical viewpoint but I also learned to ALWAYS carry a spare set of socks! Luckily my Bogs kept me feet warm. 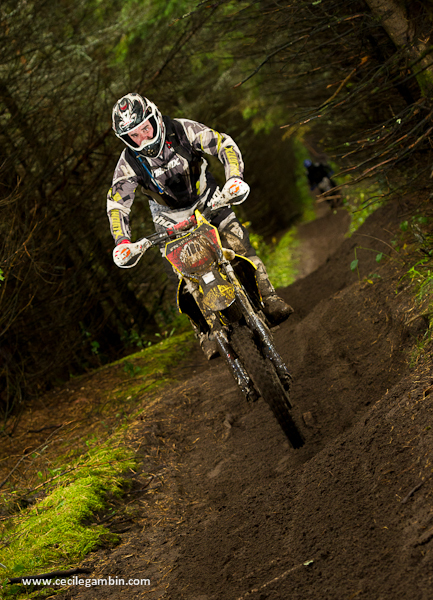 Throughout the year I have been taking pictures of both mountain biking and off-road riding enduro events and have loved every minute of it. I have enjoyed the hikes, scouting for locations (unfortunately, usually last minute), seeing racers in action and trying my best to create an artistically appealing picture that make the riders look good. The best part though was the socialising. I love to talk and meet people! Reflecting on the year though I have to be honest and say that taking pictures of an event that uses a 100+km route is not easy. Trying to scout for locations, finding them, hiking in, setting up the equipment (flashes, tripods, wireless triggers), driving to the next spot while tyring to nail a few good shots and showcase as many riders as possible is not an easy feat. A lot of time (and gas) is spent trying to find those special areas. I usually try and get to 2-3 different spots and try to get as many people as possible. Unfortunately, that’s not always possible and to those ‘unsung’ heros that did not find a picture of themselves I apologise. I try my best to get everyone. 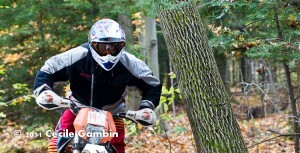 Shooting in a closed circuit is much easier and perhaps I’ll dabble into that next year at Hare Scrambles. But, I would also love to race a few of them again. 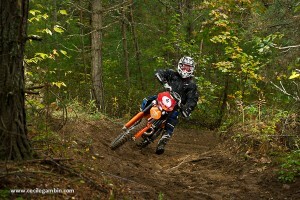 Now if only I could get a job that would allow me time to race and take pictures…now that would be ideal. See you at the races next year. And remember all my pictures are for sale. 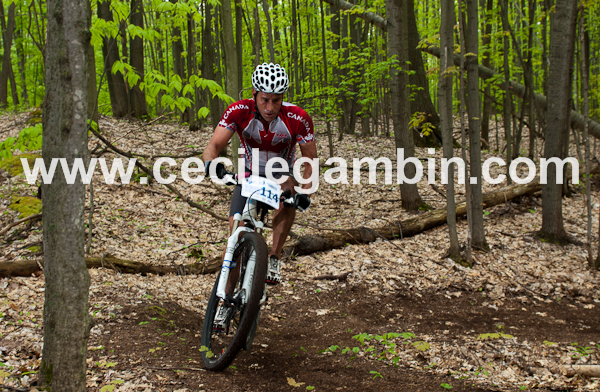 Check out my Flickr page for the pictures and price list of Terra Nova 2011: http://www.flickr.com/photos/cecilegambin/sets/72157627787251545/. Please join me on Facebook under Cecile Gambin Photography to keep tabs on what I’m doing with my photography, what event I’ll be at next and to see and learn about my fine art photographs. All pictures for The Great Pine are up on my Flickr site. Click here. 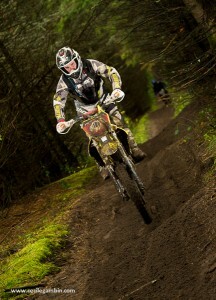 You’ll also find pictures from The Corduroy Enduro 2011 there as well but in a different album. Find your picture, email me the number or at least the key time if you remember it. And even a description of your bike would help if the plate is not easily identifiable. Prints or high quality digital downloads are available for purchase. All pictures will be corrected for colour, and watermarked removed. 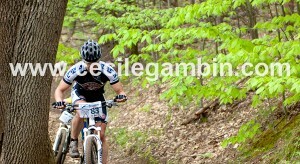 Please excuse the rather large water mark but this is to prevent people from lifting my pictures. This is currently my only source of income and I only wish to cover my expenses (gas and camera equipment). You all know I love photography and off-road riding. Thank you. The quickest and easiest way to receive a picture is through a digital download. Prints will take up to a 1-1.5 weeks (pro lab + Canada Post). Kudos to all participants for a ride well done and to OCMC and all of its volunteers for putting on a great event. 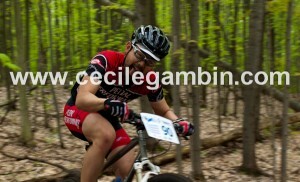 Pictures for Substance Projects Victoria’s 100 mountain bike event are now posted on http://www.flickr.com/photos/cecilegambin/. In the meantime here are a few teasers. Sorry for the large watermark but I’ve had a few people lifting my pictures without permission. Thanks for your patience and understanding!! Thanks Dan for what I consider to be a top notch event! Very well organised, managed and an amazing loop! Log onto http://www.flickr.com/photos/cecilegambin/ to view pictures and please email me either through this website or through Flickr with your plate number and race start. Pictures on Flickr site have been compressed. Purchased pictures will be high resolution and corrected for colour, exposure etc. * Printed on Glossy paper using Professional Kodak Paper. A print size that is not a 2:3 ratio will be cropped. Larger print sizes available upon request. ** Shipping & Handling costs will only be charged once up to a maximum of 10 pictures. Example, 2 pictures 4×6, 4 at 5×7, 1 at 8×12 = S&H of $8.00. Payment through PayPal using my name Cecile Gambin and email address. Thank You!